Bill Kochevar was paralyzed in a bike accident and hadn't moved his arm for nearly a decade. 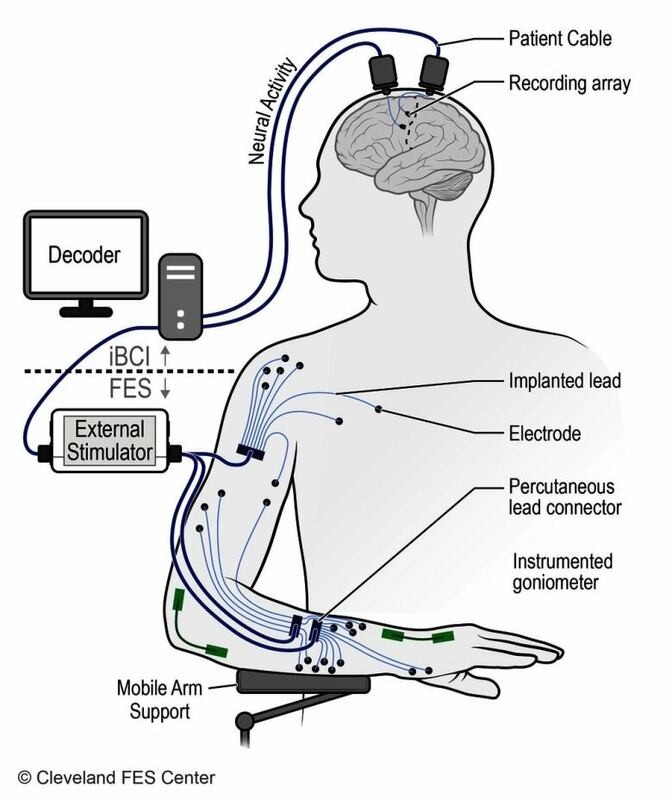 But thanks to experimental thought-controlled technology the Cleveland man can now use his brain to control his arm. After a bike accident in 2006, Bill Kochevar was left paralyzed from the shoulders down. 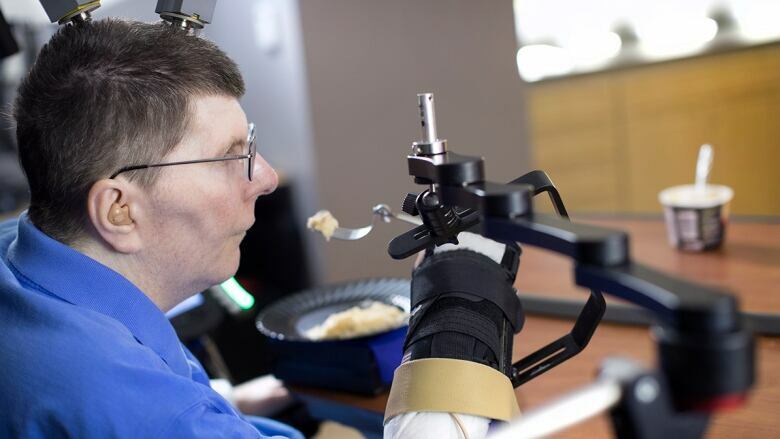 Recently, the 56-year-old U.S. Navy veteran from Cleveland, has been able to move his right arm and hand again. All he has to do is think about it. Researchers put implants in Kochevar's arm and his skull. The results were published in the medical journal The Lancet. CAROL OFF: Bill, what was it like to move your arm again? BILL KOCHEVAR: It was amazing because I had no clue what we were going to be able to accomplish. Nobody had ever tried this before with both the BrainGate and FES system implanted. So, I was like, "Wow. There's a lot of possibility in this." I immediately started thinking of things I could possibly do with it. CO: So, now — with the help of this equipment — you can move the one arm. BK: Right. I can move in and out, up and down, and I can close my grasp. CO: Can you just tell us a bit about how it works? BK: What happens is, there are two recording arrays in my head and they are recording my brainwave of me thinking of what I want to do. Then, it goes to … computers that deciphers that information and then creates signals that electrifies the electrodes in my arm and moves it in a specific pattern that makes me move in and out, up and down, whatever … The system knows when I'm thinking about a certain pattern … I think about what I want to do, it matches that up with the pattern, and says, "Oh. He wants to moves up and moves up." CO: When you first saw that arm do what you wanted it to do, how did you feel? BK: I felt glad. I was really happy, even though — when I stop using the system — I can't do all that right now. I know that the work I'm doing now is going to help a lot of people later on. CO: What have you been able to do? BK: Originally, we just did stuff on the computer. We had virtual arms that I moved in and out to make sure my brain was sending the correct signals. And then, they put the electrodes in and I was able to move my arm in and out, up and down, close my grasp — I did that. Then, when I became proficient at that, they said, "We need to put more electrodes in." They did. Then, I was able to do functional tasks. With functional tasks, I've been able to drink water, coffee, eat a pretzel stick, mashed potatoes, and even some mac and cheese. CO: And up until now, you've had to have someone feed you? BK: That's correct. Everything I eat, has to be fed to me. Now, I'm at the beginning stages of being able to do it myself. CO: You're at the beginning stages. You work with this when you're at the clinic. Is it possible that you could have a portable version of this that you could actually take with you in your life? BK: They're working on that. It's going to be quite a while before they do that. They've got to create totally implantable electrodes in the head that are wireless. Same thing with the arm — they've got to totally implant it. Then, they're working on making a small version of … computers that will hang on the chair and then I'll be able to move around, use my system when I need to, turn it on, shut it off, and continue on. CO: How will that change your life if you're able to do that? BK: It would be great. There would be some things I'd be able to do by myself — which, when you're paralyzed and can't do stuff — you miss being able to do some of that stuff. CO: What's the thing you most want to be able to do? BK: Eat a whole meal by myself. This interview has been edited for length and clarity. For more on this story, listen to our full interview with Bill Kochevar.